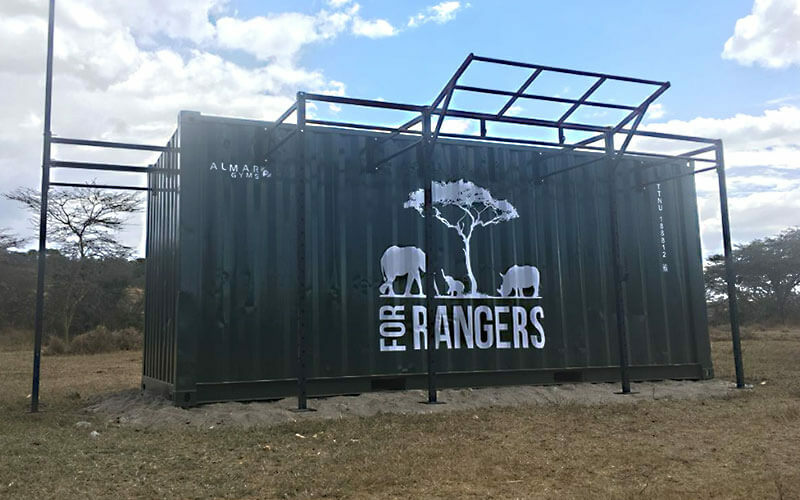 Almar Kenya has been commissioned to create four bespoke functional gym units from standard 20-foot dry containers for anti-poaching rangers to use. Three will be located in wildlife conservancies in Kenya, while the fourth is to be transported to Tanzania, and all four will provide an exciting opportunity for anti-poaching rangers to keep fit in the field. The project was initiated by the Save the Rhino charity and 51 Degrees Ltd, a Kenyan company that trains rapid-response anti-poaching units across East Africa in helicopter procedures, reactive operations, area searches, and medical skills. 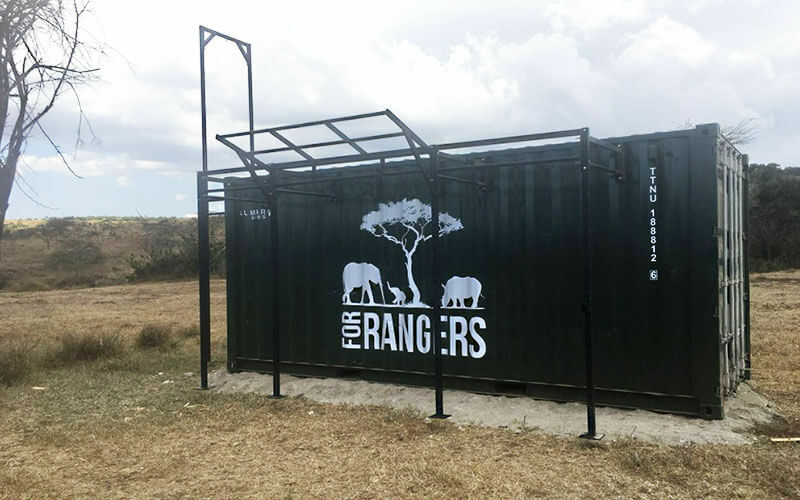 The design of the converted containers’ functional gym equipment will ensure that the rangers are able to improve their strength and overall fitness while in remote locations. The equipment in each unit consists of a series of bolted frames with pull-up bars, as well as removable dead-weight brackets and a larger frame for rope climbing at one end. 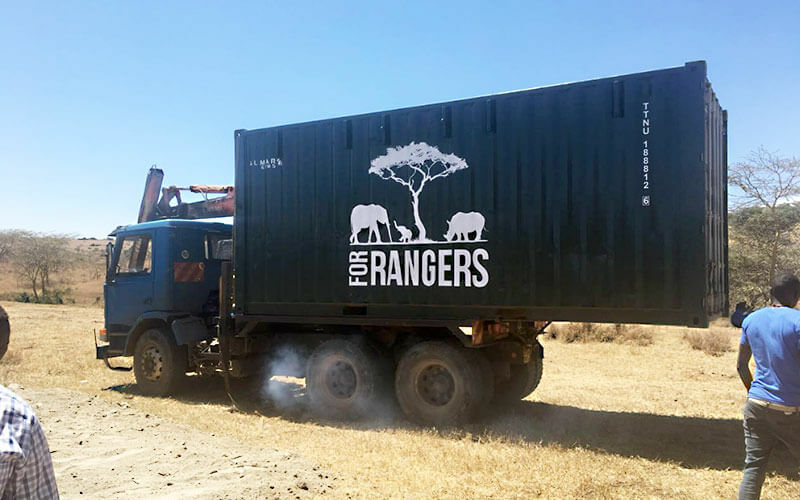 One of the converted containers has already been set up in the main rangers’ camp at Borana Conservancy in Laikipia County, Kenya. Two more are destined for Ol Jogi and Lewa Conservancies in the same region. A fourth will soon be heading for Tanzania where it will be utilized by the Singita Grumeti Fund’s team of rangers. During the past four decades, Kenyan organisations and associations have been doing everything possible to save the black rhino (Diceros bicornis) from extinction. In 1970 there were 20,000 rhinos in the country, but as a result of poaching, this number fell to less than 280 in the 1980s. One of the first initiatives was the formation of the Association of Private Rhino Sanctuaries in Laikipia that was mandated by the Kenya Wildlife Service to represent the interests of those in the private sector who were working towards conservation of rhinos. After the dramatic decrease in the numbers of rhinos by the 1980s, Kenya was hit by another surge in rhino and elephant poaching in 2012 and 2013, that led to the loss of more of these animals than at any time during the past 20 years. As a result, a new wildlife law was introduced allowing the courts to impose life imprisonment for convicted poachers. But, while poaching stats dropped, the killing continued, and earlier this year it was reported that convicted poachers in Kenya could face the death penalty. The Kenyan authorities have also introduced a high-tech anti-poaching technique that involves sniffer dogs trained to identify air samples of rhino horn and ivory. These dogs are also used to find stolen livestock, property, and even children. The Borana Conservancy is one of the newest conservancies for rhinos and since black rhinos were reintroduced to the area in 2013, it has been proven to be one of the most successful. It is relatively close to the Ol Jogi Conservancies as well as Ol Pejeta and the Solio Game Reserve, but Lewa is its closest neighbour. Borana and the Lewa Wildlife Conservancy work closely together with additional combined efforts from Kenya Wildlife Service and the Kenya Police. While a primary focus is on fighting the threat of poaching and protecting the wildlife in the local conservancies, they also assist when there is road banditry, cattle rustling, and even inter-tribal conflict. They report that there has been no poaching of rhino in the Lewa-Borana area in the past five years and that the numbers of illegally killed elephants have decreased significantly during the same period of time. The Singita Grumeti Fund carries out community development and wildlife conservation in the western corridor of Tanzania’s legendary Serengeti ecosystem. An area that experienced rampant poaching and uncontrolled poaching less than two decades ago, the Fund is responsible for one of Eastern Africa’s greatest conservation success stories.